Hello, everyone, and welcome to my part of the “Spring is in the Air” blog hop. Spring means different things to different people. For some it means finding love. I’m lucky enough to have found mine—best-selling, critically-acclaimed paranormal author Desirée Lee: www.desireelee.com. For others, it means the start of a new season of planting, farming, or gardening. For others, it simply means an end to the cold of winter. On the morning I write this post, our overnight low was supposed to have only been 33 degrees. We woke up to a chilling 21 degrees. That being the case, I’m with those seeking warming spring weather! Still others long for spring for the April showers, which bring May flowers. Rain showers… Rain forest… Jungle… The setting of my eighth novel, “Quintana Roo, Yucatan”. The book launched a publishing company (Umbral Press – www.umbralpress.com) and won an award for Second-Place in the Paranormal Romance Guild’s 2012 Reviewers’ Choice Awards a month after its release. Part of the fun of blog hops such as this are the giveaways. The “Spring is in the Air” blog hop is no exception. XOXO Publishing is offering an e-book prize package as the Grand Prize drawing for this hop. To enter, please simple comment on this blog post. Be sure to include your e-mail address, so that you can be contacted if you win. At add to the fun, I’m offering a giveaway of my own—an e-book edition (PDF format) of my novel “Predators or Prey?”. That book, my fourth novel, was the first in my Wendy Markland series. Since the book’s release in its original e-book format, there has been interested from several parties in adapting it as a film or TV series. Also, the Wendy Markland books are the basis of an up-coming, on-going comic book series called “Wendy Markland: Chronicles Nocturnum”. I’ll be writing and lettering the series. Learn more about “Predators or Prey?” HERE. To enter to win a copy, please go HERE. Best of luck to you in the contests, and thank you for visiting! Congratulations to Wendy P. on winning the e-book copy of “Predators or Prey?” during the “Lucky in Love” blog hop! Just a quick note to let you know that things are really busy here. Within the past few days, big, big news has come in on two projects I’m involved with. Please keep checking back; I’ll start releasing details ASAP. Thank you all for your support. No writer can do what we do without our fans being there for us! Green is one of my favorite colors. It’s one of the reasons I like St. Patrick’s Day so much—green is everywhere. This St. Patrick’s Day is the best ever for me, though. Why? Because it’s the first spent with my gorgeous fiancée—best-selling, critically-acclaimed paranormal author Desirée Lee. Her outstanding work can be found HERE. Desirée and I met about six years ago. Suitably enough for two authors, we met at a book signing. I was part of a group of authors appearing at a two-day signing—a Saturday and Sunday event. On the second day of the signing, Desirée dropped by, wanting to make contact with someone from a publishing house she knew would be present. I was there, seated near the person Desirée had hoped to speak with. I had copies of my first three novels with me—”Winter’s Rite”, “Well Wishes”, and “Gauntlet”. As Desirée is a fan of the fantasy genre, and since “Winter’s Rite” and “Well Wishes” are fantasy, those books caught her attention. She bought a copy of “Winter’s Rite” from me. I autographed it. We talked briefly about writing, indie authors, and small presses. And then she left. Right away, I knew I had just met someone very special. At the time, however, I had no idea how special she would become to me. We kept in touch, tentatively, on-line. Talk was almost exclusively of our work and the writing profession. Until just over a year ago, that is. Desirée and I began getting to know each other on a personal level. Now, here we are, engaged, planning our wedding for this summer, and expecting the arrival of our first child this summer, as well. This St. Patrick’s Day will be our first together. Next year will be our first St. Patrick’s Day with our baby daughter. Yes, I consider myself to be very lucky! 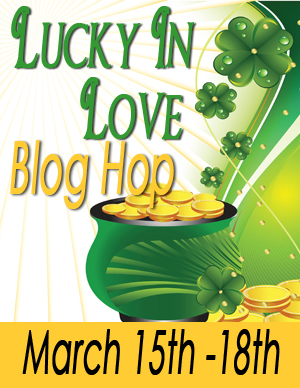 That luck extends to the honor of being able to partake in the “Lucky in Love” blog hop, too. My thanks to author Carrie Ann Ryan for allowing me to partake in this event, and be able to tell everyone a bit about my latest release. Green isn’t only found around St. Patrick’s Day. It’s also found in swamps such as Quagmire Fen—the fictional setting for my most recent release. Currently, “Quagmire Fen”, my first-ever novella, is only available via Amazon. It can be found HERE for only $2.99. The trailer for “Quagmire Fen” can be found HERE, thanks to My Book Trailers—these guys are great! One of the great things about blog hops is the giveaways. The “Lucky in Love” blog hop is no exception to that. In fact, this hop has two grand prizes that you could win! The first grand prize is a $100 Amazon or Barnes & Noble gift card. The second grand prize is a swag pack containing paperback books, ebooks, over 50 bookmarks, book cover flats, magnets, pens, coffee cozies, and more! Apologies to entrants outside of the USA, but, given the cost of international shipping, the winner of the swag pack must reside in the US. Winners will be chosen on March 19th. To enter to win one of these two awesome grand prizes, all you need to do is to leave a comment on this blog post. Please include your e-mail address with your comment so that you can be contacted if you’re one of the lucky winners! In addition to the fantastic prize giveaways mentioned above, I’m doing a giveaway of my own. One lucky winner will receive a PDF copy of “Predators or Prey?”. That book launched my Wendy Markland series. That series of books is the basis of the upcoming, on-going comic book series “Wendy Markland: Chronicles Nocturnum”, which will be published by Timeless Comics. “Predators or Prey?” can be found on Amazon HERE. To enter to win your PDF copy of “Predators or Prey?”, please enter HERE. Thank you very much for taking time to drop by as part of this hop. May the fabled luck of the Irish be with you in the “Lucky in Love” blog hop grand prize drawings, and in my own giveaway drawing. I’m now signed up for two blog hops for this month. The first runs from March 15 – March 18. The second will run from March 20th – March 29th. All of the hops I had signed up for after May 27 have been cancelled by choice of the organizer of those hops. If anyone is organizing a blog hop, and looking for authors to sign up for it, please let me know. 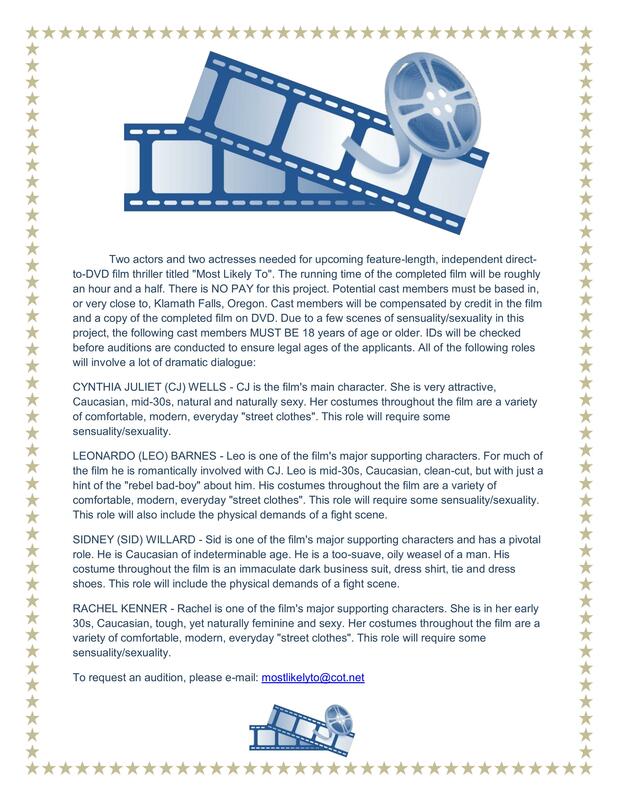 We’re still seeking potential cast members for “Most Likely To”. Despite having several actors interested in the roles of LEO and SID, we still don’t have any potentials for CJ or RACHEL.